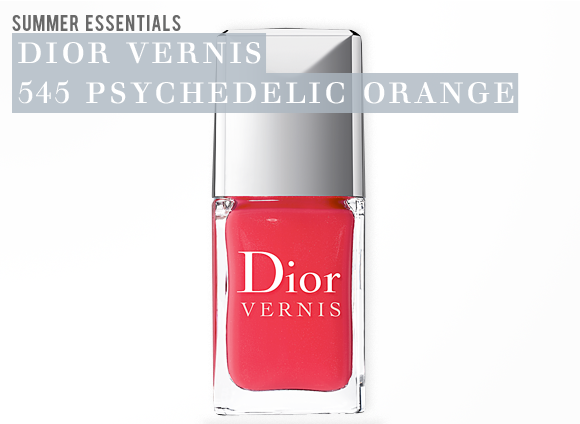 For the next stage in my Dior summer essentials run-down I take a look at a tropical coral-orange shade for your nails, Dior Vernis 545 Psychedelic Orange, which is the ideal shade for the summer. It looks equally as striking on paler skinned ladies as it does on tanned and darker tones, and thanks to the precise balance of pink and orange it doesn’t wash the skin out. 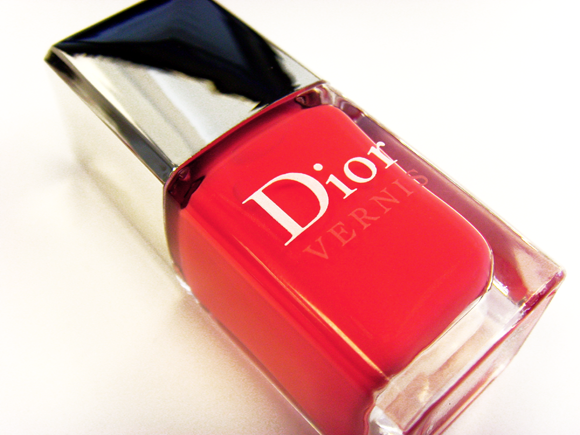 Like all of the Dior Vernis range, it comes packaged in that glossy signature glass bottle, with a smart silver cap embossed with the ‘CD’ logo. The specially designed wide, flattened brush ensures that application is as easy as possible. In just two strokes the entirety of my nail was covered. Et voilà! The formulation goes on incredibly smoothly and feels generous and luxurious. The impressive opacity meant that just one coat was enough to achieve the above result. The wear was just as impressive – one coat of Psychedelic Orange together with a top coat lasted for a week without any chips or excessive tip wear. A definite summer essential. This is a first nail polish from Dior I bought and I must say I'm in love;) I have it in 386- pink aristocrat which is a beautiful shimmery dirty pink, absolutely lovely!!! The bottle is obviously gorgeous, the texture is very nice and the brush wonderful, the best I've used so far. The quality is good but could be better in terms of its staying power. 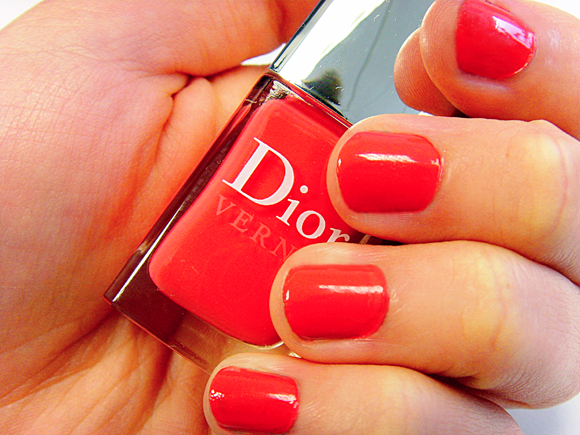 It's it expensive, as you only get 10ml bottle of an average quality nail polish BUT if you fell in love with one of the Dior's colours just treat yourself! After all it's the colour that really matters. This entry was posted on Wednesday, August 15th, 2012 at 9:00 am and is filed under Make-up, Swatches, Tried & Tested. You can follow any responses to this entry through the RSS 2.0 feed. You can skip to the end and leave a response. Pinging is currently not allowed.